Want to watch TV on your Android? Now you can. 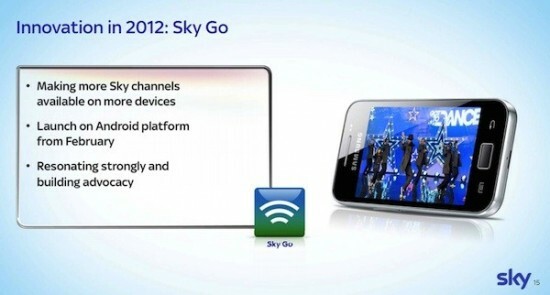 Sky Go is a service that make your Android capable of receiving TV channels. Currently, it will provide 3 TV channels from their side with more slated to pour in. “Sky Go is all about helping more people watch the TV they love wherever and whenever it suits them, so I’m delighted to announce the roll out of Sky Go to Android. We know how much Android users have been looking forward to the launch of Sky Go on Android smartphones, and we’ve done everything we can to make sure that our bespoke design is worth waiting for.” Holly Knill, head of Sky Go was quoted as saying. The app will bring channels like ESPN and Sky news for customers for some HTC and Samsung handsets with more handsets set to receive a host of channels. The app will also mean that you no longer need to fight for the remote with your family. You can watch cricket on your phone, while she watches her favorite soaps!